Helping to internationalize food and drink companies and opening up opportunities abroad for Spanish industry remain a priority for Alimentaria. 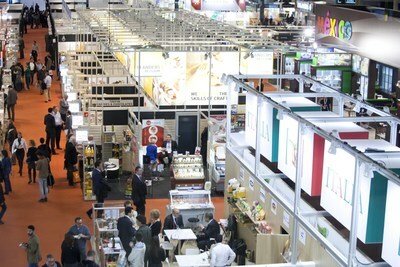 The show attracts key market buyers for Spanish agribusiness, such as the European Union, which accounts for 67% of Spanish food and drink exports; the United States of America; Latin America; Asia; the Maghreb and the Mediterranean area. Performing a strong growth, USA is the main external market for Spanish products after the EU zone, with â¬1,5 billion in 2016, the 5,6% of the purchases, followed by China (4%) and Japan (2,5%), according to the Spanish Federation of Food and Drink Industries (FIAB). Wine, olive oil and pork meat are the most exported goods. In 2018, Alimentaria aims to revalidate the levels of internationalization achieved on the previous occasion, which was attended by nearly 4,000 exhibiting companies, 1,000 of them from 78 countries, and close to 40,000 professionals - of the 140,000 who visited the exhibition - came from 157 different countries. It also aims to expand beyond the 11,200 business meetings that took place among more than 800 top-level foreign buyers invited by the show and exhibiting companies. For J. Antonio Valls, CEO of Alimentaria Exhibitions and Director of Alimentaria, this data 'confirms the international convening power of the exhibition and its effective role in boosting exports for companies in the sector', which having risen in recent years reached â¬27,5 billion in 2016, according to FIAB. Finally, the joint event of Alimentaria with Hostelco, the International Exhibition of Equipment for Restaurants, Hotels and Mass Catering will create one of the largest international platforms for the food industry, gastronomy and catering.